It takes about four hours to get through both borders and gain an hour (now it’s BST plus seven again) and we enter Mongolia at midnight. This is the least densely populated country in the world. In the thirteenth century the Mongol Empire, the legacy of Genghis Khan, stretched almost to Venice, to Moscow, Guangzhou and the Pacific. Today nearly half the people live in the one city, Ulan Bataar. The rest raise livestock, sheep, cattle, Bactrian camels, horses, goats and yak on the prairies. Many still have a nomadic lifestyle, living in round felt tents called gers, though some of the folk in the city still live in these too. The rest live in high rise blocks. Many of the city gers are in concrete compounds. It’s an odd juxtaposition. 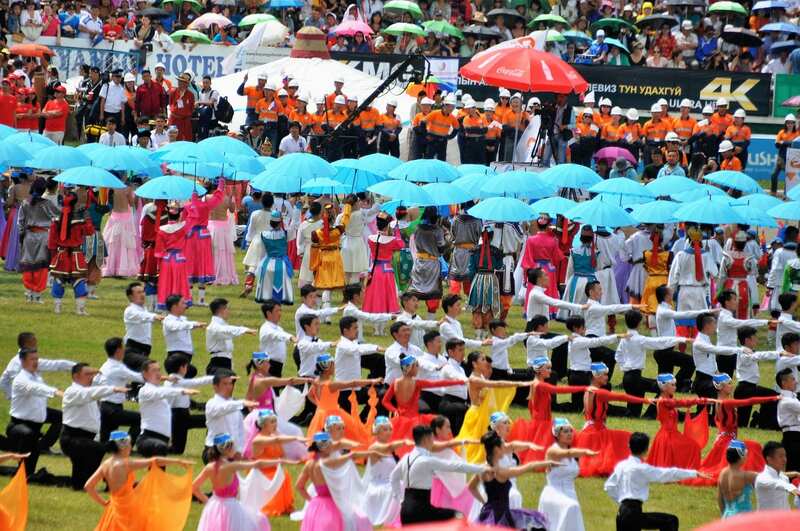 The main event today is the annual highly atmospheric Naadam Festival, part family reunion, part fair and part Olympics. Wrestling, archery and horse riding are the main three events (all tests of courage and good training for a nomadic life of endurance), though it seems that drinking is a close fourth. 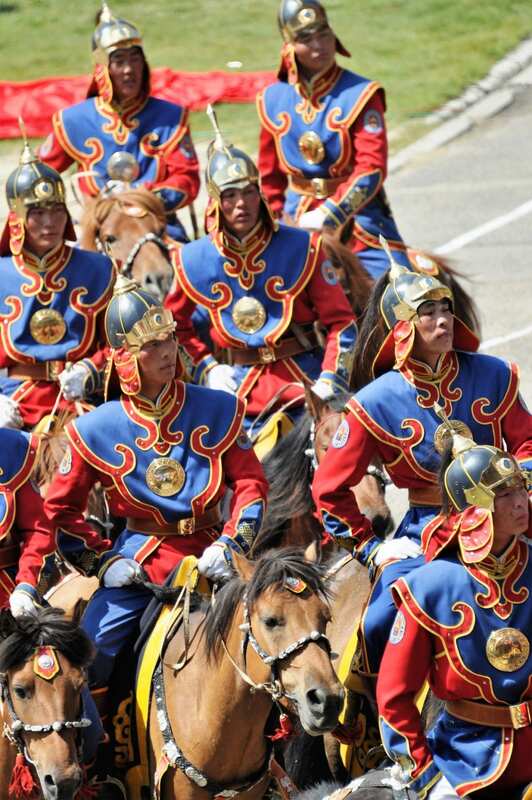 The festival begins with a military parade, Mongolians dressed in Genghis style uniforms marching to brass bands, around the main square and into the stadium, where we are seated. The event lasts nearly two hours with stirring music, the presidential address, dancing and then the introduction of the athletes. It is incredibly vibrant and hugely colourful. Most of the audience have put on their traditional clothes, as well as the participants, and we all wave the red, blue and gold national flags. It gives the London Olympics a run for their money. Then we zoom out to catch the end of the horse racing held in a village 10 kilometres away. The traffic is billed as the worst in the world, so it takes some time to get there. There is a two lane jam as we depart the city and some impatient 4WD drivers leave the road and try and cut across the steppe land instead. Here the countryside is as green, open and rolling as you would imagine and the horizon is dotted with white gers. The competitors race 32 kilometres, on high pommelled, decorated saddles or bare backed. The riders range in age from only five to 12 and travel from all over the country, camping out, with their families. Up to a thousand horses take part in each race, organised by age of the horses, and the cloud of dust announces their arrival 20 minutes before they are actually visible. The course is marked by a rope manned by soldiers that stretches the entire length of the course. The winning horse is doused, not with champagne, but with mare’s milk. The tenacity of the boys and the sturdy little horses, who have ridden for two hours for little material reward is very moving. Some are so exhausted they slow to a walk as they approach the line and the crowd urge them on with throat singing calls. Fathers and trainers, many in their best ceremonial costume, wait proudly at the finish line and lead them off to recuperate. The main religion in Mongolia is Buddhism, though there are a few Moslems. There are still also more than a few vestiges of shamanism, with worship of the sky taking prominence. Hardly surprising here in these vast open spaces. We start the day by visiting Gandan, the only Buddhist monastery that survived the Soviet invasion (in part). The monks are chanting and clashing cymbals at intervals to keep everyone awake. Large flocks of pigeons circle the rows of polished gilt prayer wheels. Then we return to the stadium to see the finals of the wrestling, archery and ankle bone shooting. There are no weight classes in the wrestling but there is much posturing. Each wrestler performs an eagle dance to display his physique before he takes the floor. He also has a second who acts as both coach and herald to announce his heroic deeds before the contest begins. The wrestlers wear small leather shorts and armlets, so there is a lot of flesh on display, but not as much as in sumo. All the bouts in the round take place simultaneously in the middle of the arena, so the contests are not easy to follow, especially as the judges (or is it the coaches?) keep intervening. In the archery the arrows are made of vulture feathers, fired at leather rings stacked up in front of screens. Men and women compete separately, encouraged by a choir singing folk songs who then double as the judges, signalling the score with their arms like semaphore. They stand very close to the targets. The guide says there are ‘no reported accidents’. 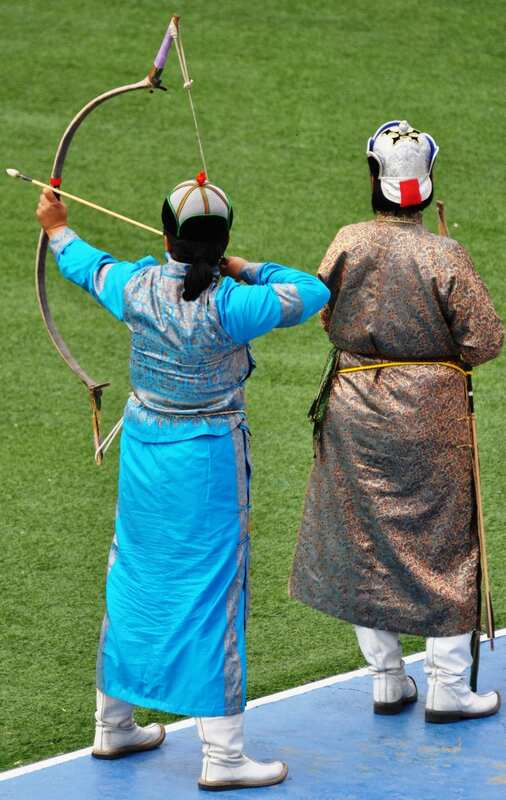 Ankle bone shooting is a relatively new sport at Naadam. It only came in 36 years ago. The competitors have to flick sheep ankle bones at more bones stacked on carved boxes. The flickers perch on tiny stools, each with its own special character and place the right leg to the side for balance. All the participants sit round in a circle shifting stools when it is their turn. As with other sports there is much vocal support and gesticulation and there is ritual tossing of the stones around the circle before each shoot is formally undertaken. The visit is not without adventure. I get locked in the port-a-loos and the attendants have to force the door backwards to get to the lock and spring it open. It wouldn’t have been a great place to spend the day. Not long after, in the throng around the stadium, a man grabs my camera and tries to pull it away. Fortunately, it is firmly round my neck. In the afternoon a short city tour. If Ulan Ude is a sprawl Ulan Bataar is a heap. It has little to recommend it. There is a lively central square with the usual theatres and museums and statues of Genghis Khan. None of the buildings looks terribly enticing. Even the best hotels would be lucky to scrape three stars. My room is looking decidedly frayed round the edges, but it is full of gadgets, presumably to pander to Japanese tourists. The toilet seat is heated and has an array of buttons that say things like ‘soft rear cleansing’. And westernisation is, inevitably, creeping in. There is plenty of construction underway and the development of mining is leading to more industrialisation. KFC opened last year and Pizza Hut three days ago. No MacDonald’s yet. The Roman alphabet has now been adopted and it is easier to see what things are than it was in Russia, though most buildings still carry Cyrillic, as well as Mongolian script. There are a variety of restaurants and, naturally we eat Mongolian barbecue. What else? Peace Avenue is the main shopping street, but Bond Street it is not. I duck into the state department store. It is just like being in Debenhams. I’m still adjusting to being off the train. The ground continues to sway at times. The group is now dispersing so there is a farewell dinner at the top of a modern tower block, with ‘a panoramic view’ of the city. It looks livelier at night and there are festival events, concerts and fireworks all over town. Over dinner there is more stirring Mongolian music, played on traditional instruments and accompanied by dancing. What else to say about Mongolia? Unless they are trying to rob you the people are very friendly. The currency is the tugrig and there are 3000 to the pound. And the countryside is just as you would imagine the land of Genghis Khan to be. There has been much excitement over the recent discovery of dinosaur skeletons in the Gobi Desert to the south, but today I head west to see the Terelj National Park. It takes forever to get out of the city, roofs in an assortment of primary colours, spreading in all directions interspersed with belching chimneys. The steppes provide non-stop entertainment. A large herd of horses gallops past, bring driven by half a dozen soldiers who rise to their audience, standing up in their stirrups and flourishing their whips. There are nomadic camps the whole way tending herds of cattle, yak and horses. We stop to watch one family milk their mares, removing the foals during the process, but leaving enough milk for them to carry on suckling. All the animals we have seen are in beautiful condition. The furniture inside the gers is neat and bright orange with Buddhist style symbols. The table is laden with dried curd, pastries and butter cream and we are offered fermented mare’s milk to drink. It’s like very strong yoghurt and a few sips is ample. The toilet is interesting – long drop and no door. Communing with nature I suppose. The park itself is stunning. The steppes narrow into high valleys full of incredible rock formations. Here the mountain slopes are dotted with commercial camp sites – identically decorated gers lined up in rows. There is even a golf course. These gers are for foreign tourists. The locals choose log cabins or brick hotels. The countryside gets increasingly busy as the day wears on. Everyone is in full holiday mode and a pair of Bactrian camels are busy giving rides. Needless to say the traffic on the return journey is appalling, compounded by a very sudden hailstorm. Within five minutes the roads are flooded, the cars have ground to a complete halt and the mountain peaks are white. To see more of my photos of Mongolia, visit this page. 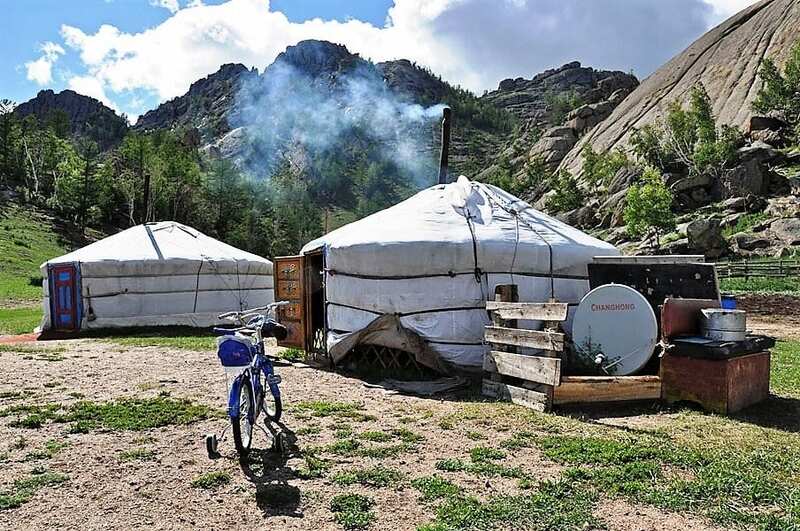 Mongolia is the least densely populated country in the world and 30% of Mongolia’s population is nomadic. 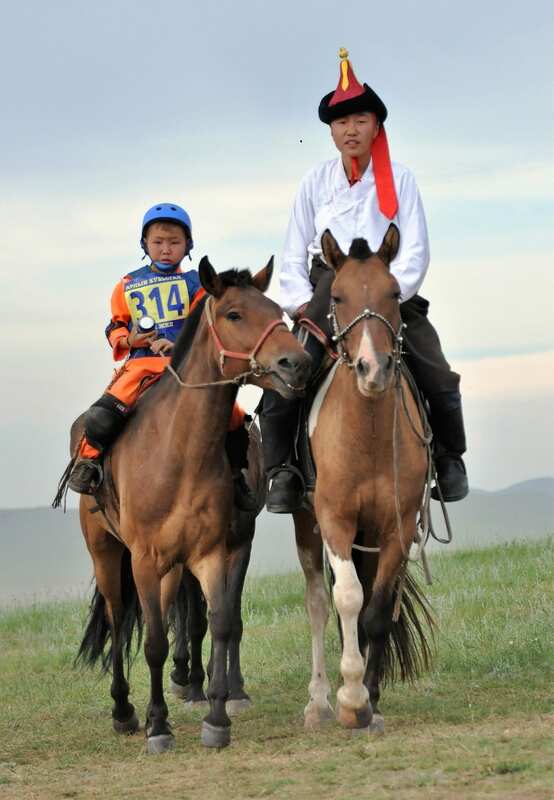 The Mongolians are the worId’s best horsemen. The two-humped Bactrian camel is only found in the wild in Mongolia and Xinjiang, China. There are more than 500,000 square kilometers of land area for every person that lives in the country. To see more of my photos of Mongolia visit this page.